This fall I’m all about layering! It’s not super cold yet but the temps are definitely starting to drop so I’ve been wearing sweaters and boots. I just got this denim vest a few days ago and I love how it adds an extra layer to this look! It’s such a great staple layering piece for fall looks! Really love the detail on this sweater ~ so classic! I love how the denim on denim looks! gorgeous photos! I love the booties and the vest! I love layering for fall too, and that vest is so great. Some day I want to go to Utah and visit those gorgeous canyons…and to ski! Such a cute look! Love that sweater. Hi Rach! I totally agree with you, Fall+Layers=PERFECT outfit! I love the sweater, it has the perfect color and looks so cozy!! LOVE this sweater, and I definitely need a few new sweaters for fall. Obsessed with this outfit! Love that sweater! 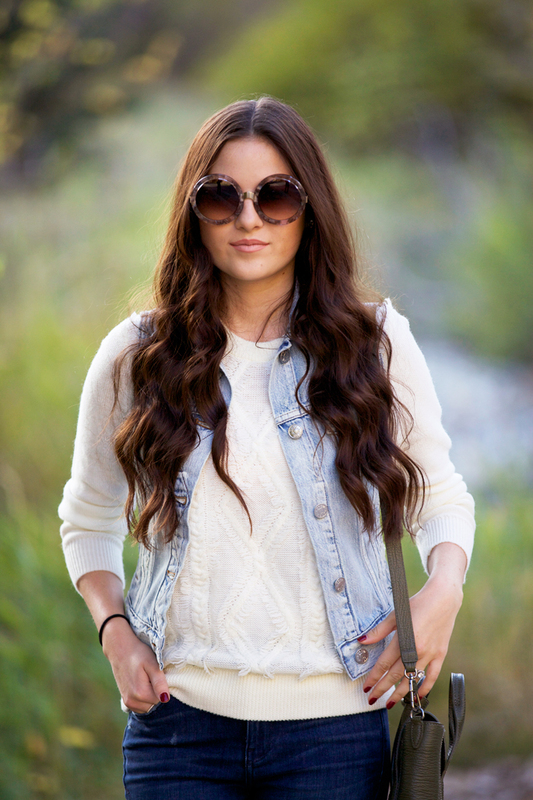 Love the idea of layering a denim vest over a cozy sweater… cute! Really like that sweater! It seems to be so cozy! I love the layers in this look and those boots! So in love with this whole outfit! Your hair is seriously gorgeous! Such cute sunglasses! Enjoy the cooler weather, it’s still hot AF here. Love seeing Dash in your posts! The texture of that sweater is amazing!! Cute styling, girl! Such a great look! Love the vest with a chunky sweater. This outfit is so stunning and that sweater looks super super cozy! How do you get your hair so gorgeous too? Lol. Hope you are having a wonderful week! Perfect fall look. Love the vest with the sweater. obsessed with your 3.1 Philip Lim bag! I’m really loving this simple, yet stylish look, Rach! Those sunnies are the perfect touch to add a bit of a statement with a simpler look :) I hope you’re having a wonderful day! cute way to layer a denim vest! love it! LOVE this look- you look adorable as always! How cute are those boots!!! Love them. Thanks for posting! Dash looks so cute in these photos! I adore this look! Lovely shoes! I love visiting your site and love love your style. Would you consider listing the sizes that you are wearing? I’ve often ordered a piece of clothing after seeing it here, only to have the sizing way off … Sometimes even on brands like JCrew that I’ve grown up on. You look awesome! I agree the vest adds to the look! The detailing on that sweater is beautiful! Very cute outfit! Love this fall outfit combo! I love this look, Rachel! That sweater is a must-have. Always love when Dasher makes an appearance too! So gorgeous! 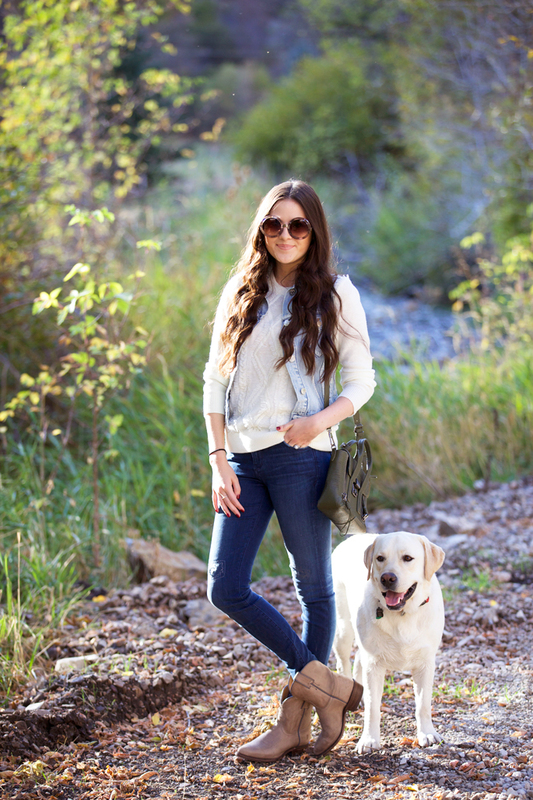 These types of outfits are my favorite for fall, and I am so excited for cooler weather! I love denim vests! They are the perfect layer for fall in Phoenix. I am so in love with your new bag. Great sunglasses! I’m digging the retro vibe of those sunglasses! (That’s why I used the term “digging.”) And I just got a dark olive bag too. It’s amazing how it goes with everything, right?! Absolutely love that sweater! I really need a cream one in my collection, its so versatile! such a cute outfit. love the boots! Cute! I need a denim vest for fall! Gosh I love this look and especially those sunnies! Such a cute look! Perfect for a hike. I love how good the Pashli bag looks with this outfit! So cute.